1. HOW DO I TRAIN TO BE A HIKER? 2. HOW DO I FIND HIKES FOR MY SKILL LEVEL? 5. IS IT SAFE TO HIKE ALONE? 6. WHAT DO I DO IF I SEE WILDLIFE? 7. 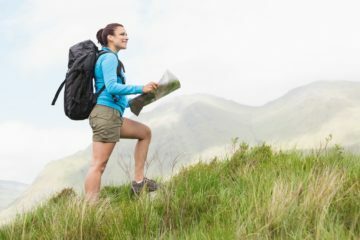 SHOULD I USE HIKING POLES? 8. WHAT DO I DO IN AN EMERGENCY? 9. SHOULD I GET A WOMEN’S BACKPACK? 10. WHAT KIND OF BOOTS SHOULD I GET? 11. WHAT’S THE BEST WAY TO TIE MY BOOTS? 12. HOW DO I LAYER? 13. WHAT KIND OF BRA SHOULD I WEAR? 14. WHAT IF I’M HIKING ON MY PERIOD? 15. HOW DO I GO TO THE BATHROOM? 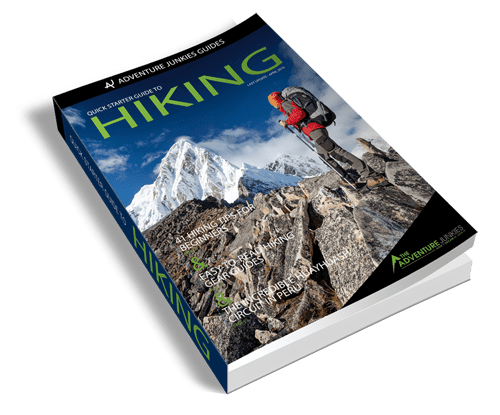 With all the health benefits of hiking, it’s no wonder you’re ready to get out there and find out what the hype is all about. The great outdoors is a place of many splendors that can change your life in ways you never anticipated. But when you’re new to hiking, it can be a little overwhelming. How do you keep yourself safe? What do you do when you need to pee? What if you run into wildlife? 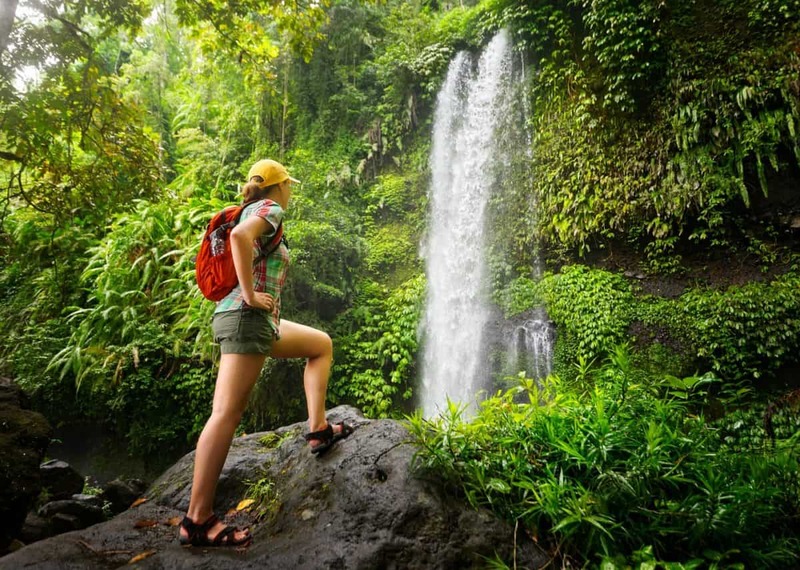 Fortunately, our Women’s Hiking Guide has you covered. 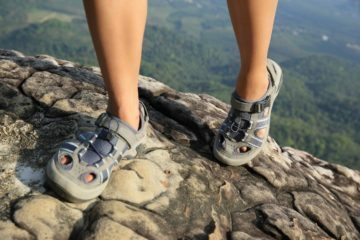 Here at The Adventure Junkies, we know women have unique hiking needs and concerns. 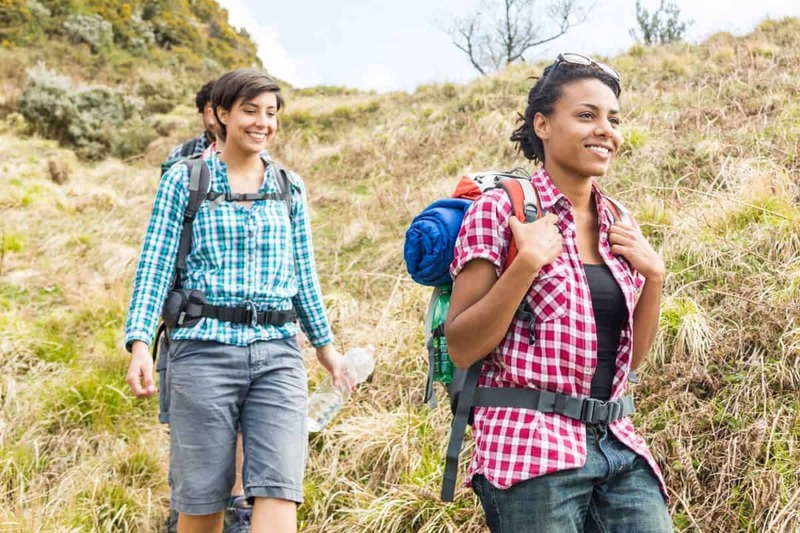 We’ve taken the time to address the most frequently asked questions women have, so you’ll be prepared for your first hiking adventure. 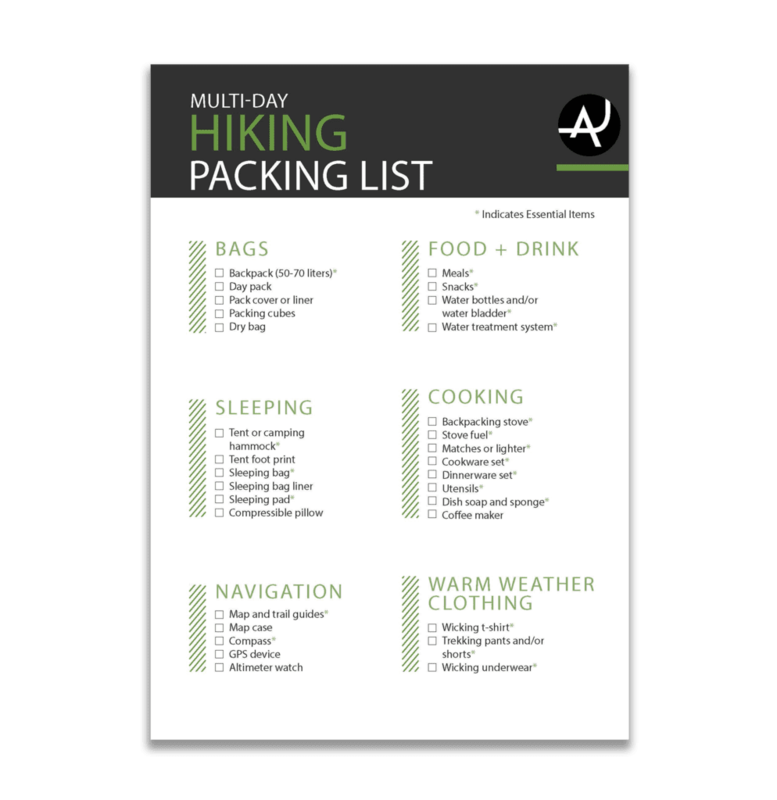 Before you know it, you’re going to be a pro at hiking. The best way to train for hiking is to maintain your cardiovascular endurance. You can do that by walking, jogging, running or hiking more. There are plyometric and strength training exercises you can do to help your muscles adjust to the motions of hiking. Hiking focuses mostly on balance, core, and lower body muscles. A routine centered around those groups will benefit you most. 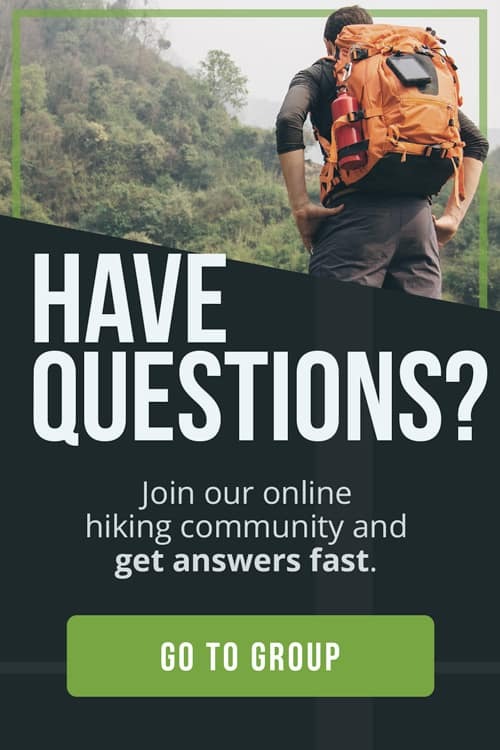 There are many ways to find hikes in your area. If you want to hike with others you can join a Meetup or Facebook group. This is the desired option for many women who don’t want to hike alone. You can also try checking your local community center or gear shop. There are great online resources that offer trail search features. You can narrow by skill level, distance, location, and sometimes features (e.g., waterfall, canyon). LNT stands for Leave No Trace. It’s a non-profit organization that promotes the concept of leaving the outdoors better than you found it. It’s based on seven principles that hikers should follow when they’re outdoors, to show respect for the space they’re in. If all hikers work together to “leave no trace,” we can keep the outdoors a pristine place to enjoy. You should always carry the 10 essentials in your pack. Beyond that, you should always have a first-aid kit. It’s also a good idea to have an emergency kit, in case you get lost. You should also have a repair kit in case you need to fix a broken boot, article of clothing or gear. Whether it’s safe to hike alone depends on how you feel. Crimes against women in the outdoors are rare. But it’s more important that you feel safe. Hiking solo can be a very empowering experience for women, but only do it when you’re ready. It can help to carry pepper spray and a whistle and talk out loud while you hike. Be cautious if you’re hitchhiking anywhere (i.e. to/from your trail), and don’t tell anyone you’re alone if they ask. How to avoid wildlife is dependent on the animal. Find out what animals may be in the area you’re hiking and educate yourself. The most frequently encountered wildlife that can harm you are bears, mountain lions and rattlesnakes. Don’t worry, bears aren’t attracted to menstrual blood. Whether you use hiking poles is a personal choice, but most women enjoy them. Since women have wider hips, their knees tend to pronate. Prolonged distances can be painful, especially when you’re hiking downhill. Hiking poles can provide relief by taking the weight off your knees and redistributing it to your upper body. They also help with balance while crossing rivers. Always tell someone where you’re going before you leave for a hike. If you’re lost, the first thing you should do is turn around. If you can find your way back, do so immediately. If you can’t, stay where you are and wait for someone to find you. It’s important that you stay put once you’ve reached the point that people might be searching. If you’re moving around, it’s harder for them to find you. Not all backpacks are created equal. You’re best bet is to find a women’s backpack. Companies like Gregory, Deuter, Osprey, Kelty, Marmot and others make packs fit for women. They have smaller frames, narrow straps and hip belts that sit higher on the waist. They’re more comfortable for women and have features designed for females. The type of shoes you want will depend on the terrain you’ll be hiking in. Many footwear companies make excellent boots, shoes, and sandals for women. You can get everything from ultralight, zero-drop trail runners to rugged mountaineering boots. Make sure they fit comfortably and offer the support you need. Between pregnancy, PMS, hormonal imbalance, and birth control, women have issues with swollen feet more often than men. The good news is, there are a variety of ways you can tie your shoes or boots that relieve pressure on different points of your foot to reduce swelling. For most seasons you want a base layer, mid layer and outer layer. Women don’t sweat as much as men so they often heat up faster. Something to consider when you’re layering for your hike. The base layer should be thin and wicking. Wool is a great material for base layers. The mid layer should be insulating, and easy to remove. Wool and fleece are popular options for this layer. The outer layer is weather-dependent. So a rain shell if it’s wet, a soft shell or down jacket if it’s cold and dry. The best bra for hiking is a tight-fit sports bra. You want to hold those babies down. Unless you absolutely need it, opt for one that doesn’t have underwires. Carrying a weighted pack with underwires can be quite uncomfortable. Apparel companies like Moving Comfort, Brooks, Patagonia, Smartwool and Prana have great options. If you expect to menstruate when you’re scheduled to hike, you have a few options. If you have time to plan, you can skip your period using birth control pills. There are potential risks involved, so talk to a medical provider first. Another option is to plan your hikes around your menstruation, so you don’t hike while you’re bleeding. If you don’t want to do those things, you can use a tampon (or pad) while hiking, or opt for a menstrual cup (like a Diva cup). It’s a good idea to keep an extra tampon in your first-aid kit in case you start your period while you’re hiking. Besides, they make a useful emergency tool. For #1, you have a few options. You can go the old-fashioned route and squat. Or if you’d like to know what it feels like to pee standing up (and who doesn’t), there are female urination devices. For #2, grab your trowel (mini shovel) and dig a 6-8“ hole in the ground. Do your business then cover it (and your TP) completely when you’re done. If you don’t want to cover it, pack it out with you. Make sure you carry a ziplock or WAG bag, and a bandana (or other ”pee rag“), TP or wet wipes with you. If you use wet wipes, always carry those out, as they aren’t biodegradable. Always walk at least 200 feet from any trail, lookout or body of water before doing your business. Going to the bathroom outdoors is one of the most freeing experiences you’ll ever have.